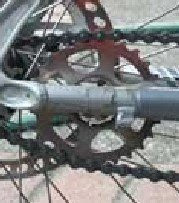 It's not connected to the frame at all, basically (when pedalling) as the upper segment of chain moves forward, the lower part moves backward, so a ghost chainring revolves inside the chain while holding its position, even though it is not attached to any part of the frame. It's definitely something that will get attention. 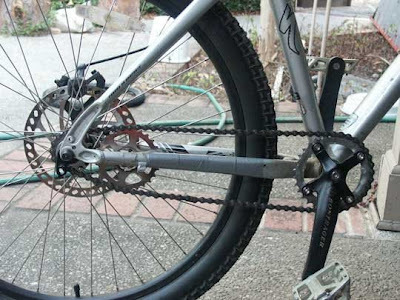 I've used one on the toddler tandem bike I built, it works pretty good to keep the chain tight. I wonder how this would work with a fixie? Below is the Toddler Tandem. I am not sure I would want my little one up front but I can see how it would be really fun for the kid to think he was in control of the bike rather than seeing Dad's fat fourth-point-of-contact during the entire ride. Here is a close up of that Ghost Ring! Ideally, what I would like to try is a mountain Tandem, modified for a child to ride in the rear, pulling the Burley Trailer. Then I could do epic rides with all three kids. that's a really cool tandem, did you make it? No, not my bike and I didn't make it either. Wish I had it though.